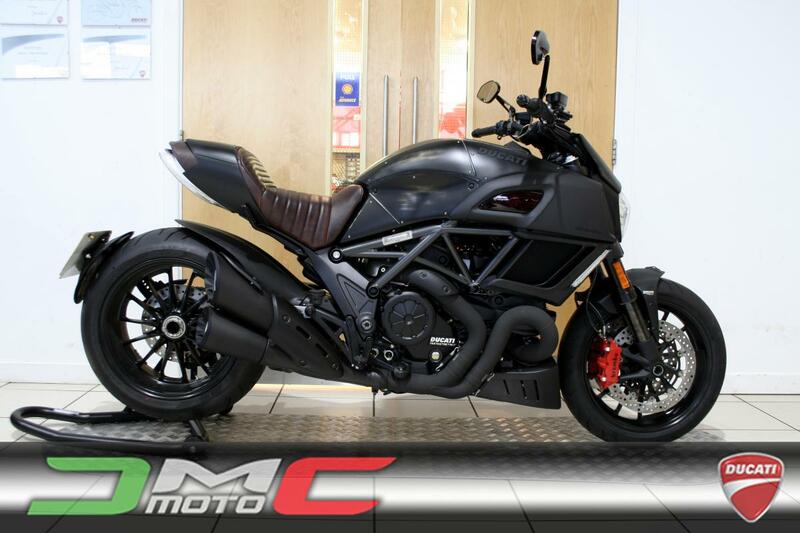 REDUCED FROM £18,495 to JUST £16,995... We're please to be able to offer you this limited edition Ducati Diavel Diesel. This is a 1 private owner bike and is number 566 of 666 produced worldwide and has covered just 471 dry miles. The Ducati Diavel Diesel is the result of a collaboration between Andrea Rosso, the Creative Director of Diesel Licenses, and the Ducati Design Center. The inspiration for their work is an imaginary post-apocalyptic and retro-futuristic world with a hyperkinetic vitality. The Ducati Diavel Diesel features hand-brushed steel superstructures with visible welds and rivets, making it absolutely unique and timeless. Details such as the tank cover, the headlight fairing and the passenger seat cover are examples of craftsmanship and style. Other distinguishing features of this very special Diavel are the covers of the side conveyors made in red methacrylate with the embedded Diesel logo. Red is also the colour of the Brembo front brake callipers, of five chain links and the LCD instrument panel that recalls vintage digital displays. Call or email for more details and to secure. Ask for a personalised video and a finance quote.